With only ten days left until the start of Howard Days, here are the TOP TEN REASONS why you should show up in Cross Plains! 10. To honor and support the legacy of an American original, Robert E. Howard. 9. In Cross Plains, Texas, no one is a stranger. 8. You will meet folks from - literally - all over the world who share a common interest: the life and works of Robert E. Howard! 7. Where else can you actually read Howard's poetry right from the front porch of the house where it was created? 6. 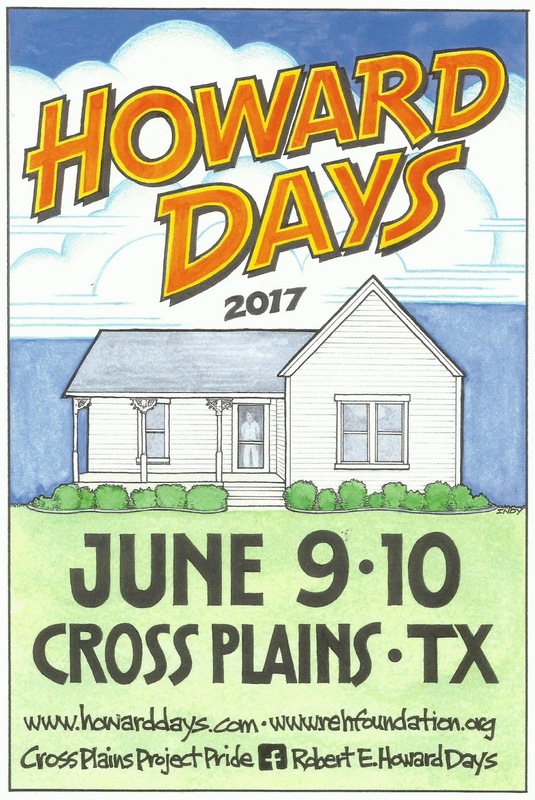 The Postal Cancellation souvenir is exclusive to Howard Days. 5. The Gift Shop, Swap Meet, Silent Auction and REH Foundation tent have Howard items that you can get no where else! 3. The Friday Hot Dog Lunch, the Banquet and the Saturday night BBQ offer up some fine Texas vittles! 2. You can meet interesting people and exchange thoughts and ideas at the myriad of interesting Howard-themed panel presentations. 1. Howard Days in Cross Plains is like a big family reunion - only with people you really want to see! We hope to see you at Robert E. Howard Days this year - it truly is the Best Two Days in Howard Fandom! Y'all come! clips to give your posts more, “pop”! Your content is excellent but with images and video clips, this blog could undeniably be one of the most beneficial in its niche. Amazing blog!